In my last column we followed Friar Altamira in 1824 during his expedition to establish the last mission to be built in California. At the time, he pretty much had his mind made up to place the final mission at today’s Sonoma. But he continued on, to check out the Napa area and Suisun Valley near today’s Rockville. He rejected both as the final and only mission site to be established under Mexican rule. Napa was rejected even though it had many of the same assets as the Sonoma area, but not as much available water and he rejected Suisun Valley because of a lack of timber that could be used for building and the excessive distance from the Presidio of San Francisco. Building of the Sonoma Mission was begun in the spring of 1824 and 602 Christian Indians from the older missions had been moved there by the end of that year. The first new convert at the mission was an Ululato from the Vacaville area, baptized on April 4, 1824. By the end of the year, Altimira also decided to establish a Rancho near Rockville about a quarter mile south of today’s Stonedene Mansion. The site probably had been part of the original Suisun Indian village that extended to the site where the Stonedene Mansion stands today. Even though it didn’t have the qualities for a full mission, it was considered an ideal area for raising horses and cattle. Along with the Rancho, he also built a small sub-mission known as an Asistencia, naming it Santa Eulalia. It included a temporary house for the neophyte Indian Alcalde (mayor), probably Jesus Molino of the original Suisun Village, and a horse corral that was run by the alcalde and his family. An adobe house was built for the use of visiting padres. According to San Francisco Mission records, an infant that had been born at Santa Eulalia was baptized on August 14, 1827. In the following year a Christian Tolena woman, Olimpia Nauayac, died at Santa Eulalia. She was the mother of Hipolito Guilac who had been baptized at the Mission Delores at San Francisco. During those years from 1824 to 1832, the Christian Indians grew crops and ran livestock around the site and probably lived in wattle houses between the adjacent hills and the present day Suisun Valley Road area. They also worked to convert non-Christians from Hill Patwin and Valley Patwin tribes to the north. The Suisun Indian, Sino, was baptized at Mission Delores at San Francisco Solano and given the name Francisco Solano on July 24, 1810, shortly after the battle between Moraga and the Suisun Indians. He was among the Indians that were sent to the Mission San Francisco Solano at Sonoma in 1824 at the age of about 25, and by 1826 he was one of the alcaldes (missionary-controlled Indian headmen) of the Sonoma Mission. Note, the name “Sem-Yet-To” was not applied to him nor was there yet any indication as to being a chief of the Suisuns. In the last column we saw that Francisco Solano’s provisional grant issued to him in 1837 finally was made official on Jan. 28, 1842. It is interesting to note that General Vallejo’s own personal lawyer represented Francisco Solano and Vallejo’s nephew, Governor Juan Alverado approved the final grant. It appears that crafty old General Vallejo’s intention all along was to acquire the Suisun Rancho for his own use when he bought the land from Francisco Solano just four months later for $1,000. In 1850 he sold the land to Archibald Ritchie for $50,000, a tidy profit by any measure. At this point we don’t know how much time Solano actually spent at the Santa Eulalia Asistencia. Most travelers who wrote accounts of their trips through the area during the 1840s usually only mentioned one of Solano’s fellow Indians, Jesus Molino. One thing that seems certain is that in 1846 when the Bear Flag Revolt occurred, Francisco Solano disappeared from the scene altogether. It is said that he feared that his good friend Vallejo died when he was imprisoned at Sutter’s Fort. Unsubstantiated rumors say that he wandered far to the north, even as far as Alaska, although that is hard to believe. In 1848, the war with Mexico ended with the signing of the Treaty of Guadalupe Hidalgo and California was annexed to the United States. The gold rush began and was the pivotal point for great changes by 1850 in California. Solano had returned in 1850 to find his old friend Vallejo was still alive and then returned to his home at the Santa Eulalia Asistencia. From this point on history becomes quite unclear as to accuracy and documentation of Solano’s death. 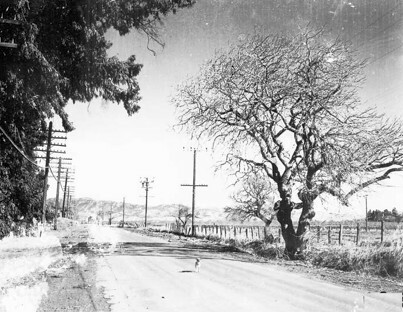 According to ‘Solano, The Crossroads County,’ an illustrated history, by Frank Keegan, “Samuel Martin, with a party of Americans discovered him (Solano) fatally ill at the rancho in 1850 and notes his passing.” Various reports over the years placed his burial under a buckeye tree alongside the Old Sacramento Road (today’s Suisun Valley Road) near Rockville, across from the Martin stone mansion that was built in 1861. The burial site is commemorated today with a bronze plaque on the Solano County College campus. The road has had been modified and widened over the years and the buckeye tree no longer exists. During the early 1850s, squatters settled on the Suisun Rancho lands. On Dec. 11, 1850 General Vallejo sold most of the Suisun Ranch to A. A. Ritchie. Ritchie then sold one-third of the Suisun Rancho to Captain Waterman. During this time the grant was in dispute and the Land Grants Commission was formed to determine ownership of the land. The ownership by Ritchie was confirmed in 1853 and a patent issued later, which made the sale to Waterman legal.